Eirebus is Dublin’s leading coach company and tour operator, with a fleet of 40 luxury touring coaches and an unrivalled reputation for quality. We offer one of Ireland's finest fleets of coaches for private hire ranging in size from 4-53 seats, so you know you're getting the best quality when you select Eirebus as your bus operator. We also offer a selection of excellent value pre-packaged short breaks and vacations in Ireland. With over 40 years of experience in providing tour packages and coach charter services for corporate and leisure travellers alike, we are experts in executive coach travel. Wedding days can be stressful enough without having to worry about whether your coach hire provider will be able to transport all your guests to and from the reception in time and in comfort. Here at Eirebus we are well aware of this and strive to ensure all goes according to plan - and certainly we haven't lost a guest yet! 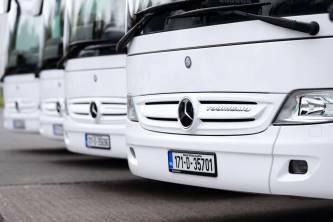 Our coaches are top of the range, updated every year and meticulously maintained at our headquarters located close to Dublin Airport. Our professional team of office staff and drivers work together to ensure that our wedding coaches and minibuses always run on time and provide an extremely comfortable journey for all passengers onboard. We have a fleet of 50 deluxe coaches so you can be assured we can cater for even the largest of wedding day celebrations. 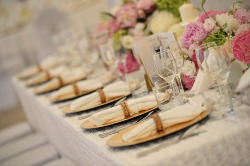 All coaches can also be customised to your wedding theme if so desired (we can't do this personally but we're happy to allow you and your wedding planner to organise the decor, where possible). We can also arrange for a plain white coach to transport your wedding guests, subject to availability. For more information or advice on what type of coach to hire for your special day, just call our coach hire specialists Philip or Rachel on 01 8242626. Philip or Rachel will be delighted to talk you through your options and explain the costs involved. Alternatively, you can email info@eirebus.ie or fill out a contact form and we will endeavour to return your call as soon as possible.